As night settled on April 20, 2010, a series of explosions rocked Deepwater Horizon, the immense semisubmersible drilling platform leased by British Petroleum, located 40 miles off the Louisiana coast. The ensuing inferno claimed 11 lives, and it would rage uncontained for two days, until its wreckage sank to a final resting place nearly a mile beneath the waves. On the ocean floor, the unit's wellhead erupted. Over the next ten weeks, as repeated attempts to cap the geyser failed, an estimated 200 million gallons of oil--the equivalent of 20 Exxon Valdez spills - - spewed into the Gulf of Mexico, eventually lapping up on beaches as far away as Florida. 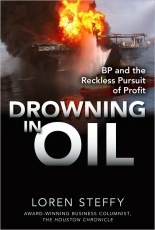 Drowning in Oil, by award-winning Houston Chronicle business reporter and columnist Loren Steffy--considered by many to be the writer with the best access to the story - - is an unprecedented and gripping narrative of this catastrophe and how BP's winner-take-all business culture made it all but inevitable. Through never-before-published interviews with BP executives and employees, environmental experts, and oil industry insiders, Steffy takes us behind the scenes of 100 years of BP corporate history. Beginning with the conglomerate's early gambits in the Middle East to its recent ascent among energy titans, Steff unearths the roots of the Gulf oil spill in the unwritten bargain between oil producers and consumers, whose insatiable appetites drive the search for new supplies faster, farther, and deeper. Exhaustively researched and documented, Drowning in Oil is the first in-depth examination of how a lack of corporate responsibility and government oversight led to the biggest offshore oil spill in U.S. history. It is an objective, nopunches - - pulled account of the energy industry: its environmental impact and the intense competition among stakeholders in today's oil markets. This book puts all the pieces together, offering a definitive account of BP's pursuit of outsized profits as the industrial world awakens to the grim realities of Peak Oil.